Speexx Wins Best Online Distance Learning Programme – Again, 10 Years Later! 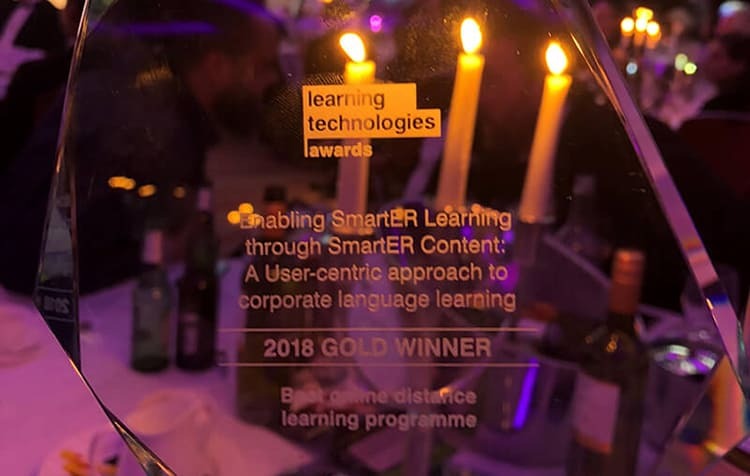 At the highly-anticipated annual Learning Technologies Awards, held in London on November 21, a glittering night was made even more special as Speexx took home Gold for Best Online Distance Learning Programme. Learning professionals from all over the world gathered at the Park Plaza Westminster Bridge Hotel in London, UK, on 21 November to celebrate the very best in learning technologies, and witness 64 gold, silver and bronze awards being given out to worthy winners. The evening was hosted by comedians Deborah Frances White and Sindhu Vee. The award was received by Armin Hopp, on behalf of the Speexx team. For a complete list of awards granted to Speexx, please visit this page.